Just a quick post for you tonight to share the card I made for the Color Throwdown Challenge. Now I'm off to make it an early night. Migraines are not fun! How wonderful! Love your clean + crisp design! Thanks, Amy! I have developed a love for clean and simple. This is so pretty!! I love the clean design and the fun scallop edge you used. Beautiful card! I love the flowers! 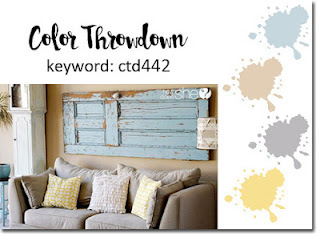 Thanks so much for playing along with us at the Color Throwdown this week!! Thanks, Broni! Great colors with which to work.